The 2009 regular session of the General Assembly adjourned at midnight on June 3 as required by law, but immediately called themselves back into a special session at 12:01 A.M. on June 4 to consider the budget and related fiscal matters. They called the special session to order, then immediately recessed it to meet again at the call of the chair. This means the General Assembly can now take as long as they want to develop both a budget and the means to raise the money necessary to finance that budget. Once a budget is developed that either the Governor will approve or the leaders in the General Assembly believe they have enough votes to override a veto they will call the full General assembly into session for one day to pass that budget. Although the State’s new fiscal year began July 1, if the budget has not been passed everyone must still pay their taxes and the Governor can authorize spending for essential services, so most people will not see any change in the day to day operations of state government. Meanwhile the budget debate behind the scenes may go on and on through the entire summer and possibly into the fall. While the General Assembly has been working on the state budget, every town and city has had to pass a local budget for their fiscal year which also began July 1. The municipal budgets take into account the grants they expect to receive from the State for many things. This year each town has had to make some assumptions about how much money they will receive in state grants and what that money may be used for. Depending on how accurate those assumptions were, the towns may have to revise their budgets when they know definitely how much assistance they will receive from the State. Because of all the problems with the budget, most bills dealing with money were not brought to the floor of the General Assembly in its closing days and died for lack of action. Despite all this doom and gloom, two bills the Grange supported did pass on the last day of the General Assembly’s regular session. One bill will continue the Community Investment Act which provides funds for farmland preservation, open space, affordable housing and historic preservation and the other will provide a subsidy to dairy farmers when the price they receive for their milk is less than their cost to produce it. Both of these programs will be funded through a charge on all deeds, mortgages and other documents recorded in the local land records. As I am writing this, Governor Rell has not yet signed this bill into law, but has indicated that she will do so. The National Grange Legislative Fly-In was held May 18 and 19 in Washington, D.C. On Monday we heard speakers on various topics the National Grange is supporting and on Tuesday we had meetings at the legislators’ offices on Capitol Hill. Alma Graham and I were fortunate to have meetings with aides to Senators Dodd and Lieberman and Representatives Courtney (2nd District) and Murphy (5th District). The highlight of our day was a meeting with Rep. Rosa DeLauro (3rd District) and her Appropriations Associate, Brian Ronholm. Rep. DeLauro chairs the House Subcommittee on Appropriations for the U. S. Department of Agriculture, so this meeting was very important to both the Connecticut State Grange and the National Grange. 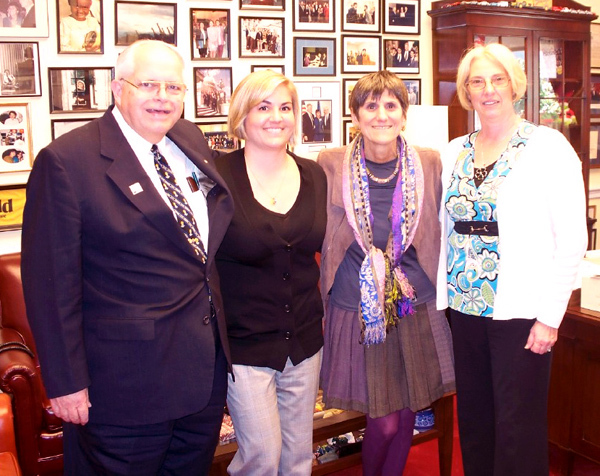 Most of our meeting was concerned with the new Food Safety and Security Act (House Resolution 875) which Rep. DeLauro recently introduced and was co-sponsored by Rep. Joseph Courtney and Rep. Christopher Murphy. I devoted my column in the May issue of the Connecticut Granger to this proposed act and the many rumors circulating about it. 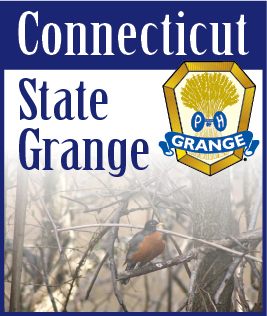 We agreed that Rep. DeLauro’s office will keep the Grange posted on all actions concerning this bill and the Grange will keep our members and the general public aware of the facts. Commenting on this agreement, Rep. DeLauro said, “People will believe the Grange before they believe me.” What a nice comment on the reputation the Grange has both in Washington and in Connecticut.